Rabbit nails, as with human's nails, grow continuously and need to be periodically trimmed. If you do not take care, the nails will grow long and sharp, making it uncomfortable, and eventually painful, for the rabbit. You can get the nails safely trimmed by taking a visit to the vets, or there is the option of doing it yourself. If you decide to try it yourself, there are instructions below on how to do this. Many rabbit owners prefer to have a vet do the job. An experienced vet will do the job quickly, effortlessly with no, or minimal, pain to the rabbit, thereby giving the rabbit less stress. The vet's costs should only be a small fee, though you should check the vet's charges before making the visit. House rabbits will suffer with growing nails because carpets and the lack of digging or burrowing in runs etc, will not help keep the nails trimmed back. One way of keeping the rabbit nails in good shape is to make sure the rabbit has plenty of good exercise in a run or similar. The run should include a concreted area such as a path or paving slabs and an area for the rabbit to dig or burrow so they can they can wear down their nails naturally. If you have a run that is only contains grass, try putting a paving slab or two in the run. 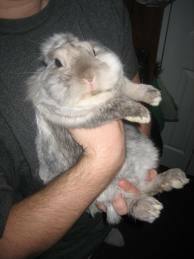 How a rabbit can be held when the nails are being clipped. If you wish to try the job yourself, holding the rabbit like this will make it easier for a second person to clip the nails without the rabbit struggling. If you want to clip rabbit nails yourself, you save the cost of a vets fees. However it can be difficult to the inexperienced, especially the first time. Some, who attempt to cut the nails, then decide that perhaps a vet might be a better idea. If you are worried, consult a vet for a demonstration of how to do nail trims or pay the vet and watch so you know what to do next time. Practice will make it much easier. To do the job yourself, you need the correct clippers; you will need to know how to hold the rabbit in the correct position and then, how to correctly trim the nails. If rabbit nails are lightly coloured you will see the blood vessels inside and you clip just before that point. Dark coloured nails make it harder to see the blood vessels. If you cause the rabbit to bleed you can hold with pressure a cotton ball to the wound. You will need trimmers, towel, cotton swabs and something to treat the nails if accidentally cut too short. You should have someone else to hold the rabbit gently, but firmly. Wrapping a rabbit in a towel will help keep them calm and restrained. Ensure you restrain the hind end well to avoid the rabbit kicking out strongly. This way you will also find it is easier to isolate a paw. Do not pin or hold the rabbit by its head or neck. The rabbit will struggle and harm itself. Trim only the tip of the nail. It is always better to trim just a bit frequently than try to trim off a lot once the nails get too long. Place the clippers on the nail where the cut is to be made. If you can, apply gentle pressure and if the rabbit flinches move a bit toward the tip of the nail. Make the cut in a firm, swift motion to avoid crushing the nail. If you accidentally cut a nail too short, do not panic, wipe the blood away with a cotton swab/wool and apply a little pressure and quickly place a pinch of a product such as Kwik Stop (or cornstarch or flour) on the end of the nail and pack it gently. Repeat for all the nails. Take a break between feet if your rabbit is struggling or the procedure is taking a while. This is especially important if you are using a towel for restraint, to prevent overheating. Recheck all the nails to make sure they are not bleeding before leaving the rabbit alone.